"SCOOBY-DOO AND KISS: ROCK AND ROLL MYSTERY"
I honestly never thought I'd see a stranger Scooby-Doo mash-up than the one that paired him with WWE wrestlers. But then Scooby-Doo and KISS: Rock and Roll Mystery came along. That's right – America's favorite mystery-solving dog and his pals have teamed up with one of the biggest rock bands of the '70s and '80s in this new movie, which comes to DVD and Blu-Ray on July 21. It's one of the strangest animated features I've ever laid eyes on...and, to be honest, it's pretty awesome. The film is set at an amusement part called KISS World, where a spooky witch has been chasing people away. The Scooby Gang – Fred, Velma, Daphne, Shaggy, and Scooby-Doo – coincidentally arrive right around the time this is happening. (Daphne, it seems, is a huge KISS fan. Who knew?) They offer to investigate the strange goings-on, but KISS has already been called in to take care of the job themselves. The two teams end up working together on the mystery, which takes them deep into the heart of rock-and-roll insanity. Part of what's cool about this movie is that the members of KISS do their own voicework. If you've ever wanted to hear Gene Simmons and Paul Stanley acting opposite a cartoon dog, this is your big chance. Even better, the rockers don't really portray themselves; they portray exaggerated versions of their onstage personas (Starchild, Demon, Catman, and Spaceman). Each possesses some kind of magical power, such as breathing fire or shooting lasers. In other words, Rock and Roll Mystery starts off on an intentionally over-the-top note and proceeds to go upward from there. You also get Penny Marshall playing a character in KISS make-up, if that helps sweeten the deal. Scooby-Doo and KISS: Rock and Roll Mystery additionally boasts some authentically witty jokes, touching on subjects ranging from Fred's bland taste in music to crass commercialism in the record business. The band even willingly sends itself up from time to time. Perhaps needless to say, there's nothing of any substance here. Then again, it's Scooby-Doo meeting KISS. What more do you need? Even if you aren't a big KISS fan (and, for the record, I'm not), the movie's cheerful headlong march into hard rock fantasy is surprisingly potent, off-the-wall entertainment. Your kids will dig it, too. Bonus features on the Blu-Ray are two '70s-era episodes of the TV show, a short segment in which cast members are asked to identify their favorite Scooby-Doo character, and a blooper reel of KISS attempting to record a promo spot for the movie. Picture and sound quality on the Blu-Ray are outstanding, ensuring that the film is a treat for both the eyes and ears. 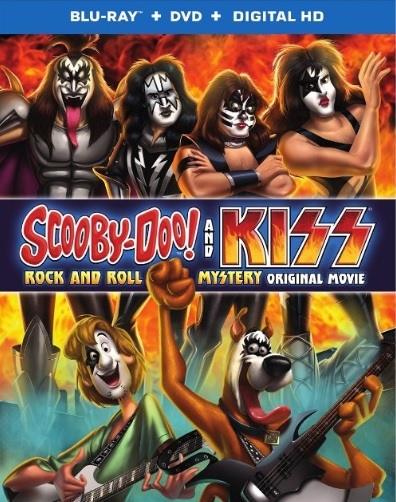 Scooby-Doo and KISS: Rock and Roll Mystery is unrated, but suitable for all ages. The running time is 1 hour and 19 minutes.